The Sunday lunch at The Old Jail was recommended to me by the same person as Bo Peep, so I had high expectations. Booking was easy, a quick phone call and we were all set set. 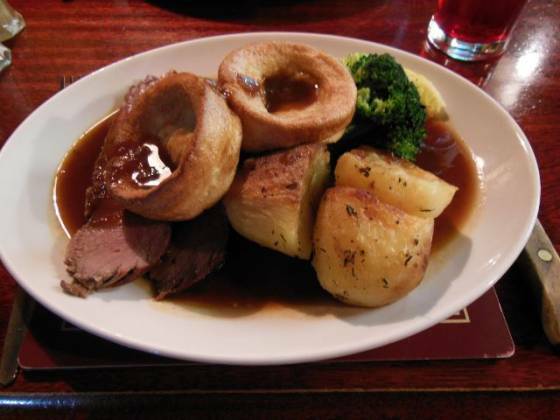 We were actually asked if we would like to pre-order our roast meat! Yep – I ordered one beef and one chicken. This was a county pub down a long road through Kent and Westerham countryside. 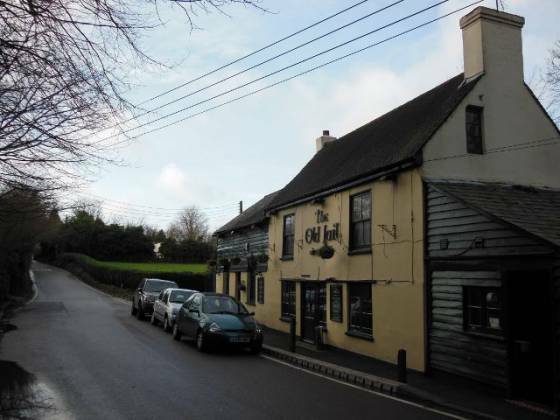 The pub parking was simple, large car park’s next to the pub. The garden was large, with a few table and benches dotted around. Also, a children’s play area was available, so this would be good for a family in the summer. Entry to the pub was through the garden. Going through to the bar, the first thing I noticed was how low the ceilings were. It was also quite dark. It was a bit crowded around the bar area and initially felt claustrophobic. I think the pub was booked up for a large Christmas party as there were a couple of sections with tables and dressed up with decorations / crackers etc. So, I assume the pub would be a bit more stretched out otherwise. We were directed to our table and a drinks order was taken (Claire on the soda water, mine a blackcurrant and soda). As we settled at our table, I noticed a lot of Biggin Hill memorabilia. The carpet was very much a “country-pub” affair, as well as the wall paper. There were quite a few nooks and crannies, such as a small brick stove in the corner. I would have loved to have explored further as I reckon there were loads of other hidey holes around. 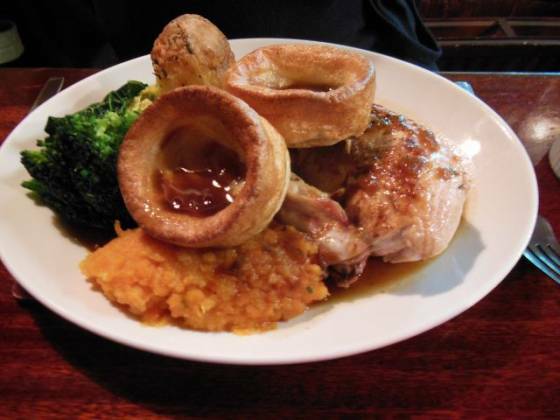 When deciding what to have for Sunday lunch, I noticed that there was not a menu on the table – the food was listed on a blackboard the other end of the bar. This meant I had to take a photo on my phone to then show Claire (whilst quaint, not very convenient). They had various starters available, as well as numerous mains – we went for our pre-order, being Roast Beef for me and a Roast Chicken for Claire. A steak knife was brought out for me to use with the beef (+1 point for this!). Sunday lunch was served very quickly, coming out 5 or so minutes after our order. It looked alright, a few slices of beef (chicken supreme for Claire), 3 roast potatoes, vegetables, two Yorkshires and gravy. Lastly, the gravy. This was actually onion gravy, so gave the whole meal a nice flavour. It was also plentiful so I could steal an extra potato from Claire’s plate to mop up! The dessert menu / board was promptly brought over – the usual traditional pub treats were here, such as cheesecake or apple and cinnamon crumble (both of which were almost chosen). In the end, I decided on the syrup sponge. 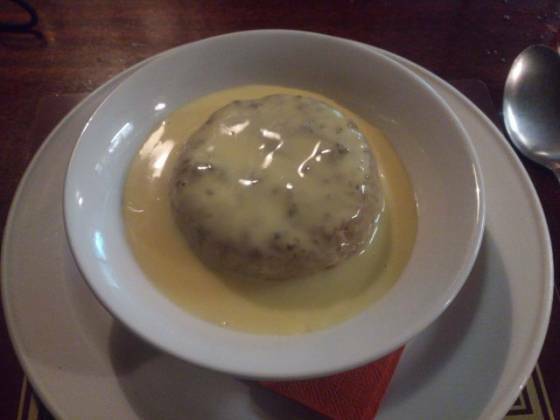 It came out around 10 minutes later, a large sponge in the middle of a custard moat! It reminded me of childhood, with the sweet syrup and then the hot, sweet custard. Very nice and well worth the £3.95! To conclude… During the meal, the pub grew on me. The nooks and crannies gave an interesting feel to The Old Jail. The ceilings and darker lighting provided a relaxing atmosphere – I felt very cosy and comfortable. The service was quite good, we were looked after well. The food (apart from the carrots) was excellent, I thoroughly appreciated the extra flavours each aspect of the meal had (such as the proper onion gravy and garlic potatoes). Oh, and who could not mention the price? £8.95 for a nice lunch – I had a dessert plus two drinks (ok, soda waters etc), and it all cost £25 including tip! I am so pleased to have found a place which hasn’t been affected by the gastropub pricing of London – I rarely pay less than £10 for a Roast, and pay at least £4.95 for a pudding. So, what could they improve? I would definitely prefer a different vegetable selection. Also, the table setting was very basic (dinner matt and knife and fork), it would be much better to have a menu to choose from! Overall, whilst not a posh Sunday lunch, definitely a reasonably priced roast at The Old Jail. Go for the roast potatoes, if for nothing else!